Salad can be delicious! Especially when you top it with steak, roasted potatoes and homemeade croutons! OK, I really don’t have a problem with salad, but these things only help the situation. You know what else helps the situation? The spicy Caesar dressing. It’s easy to whip up and keeps really well, so you can use it for delicious lunches all week! Here’s how you make it happen: start by throwing some egg yolks into a bowl. Whisk in some garlic, chipotle peppers, lemon juice and a bunch of other good stuff. You’ll be left with a gorgeous and flavourful dressing. Line everything up that you’d like to have in your salad. FYI there are also perfect roasted potatoes in the oven at this time 🙂 I also used the home made croutons from this Panzanella Salad recipe. Don’t underestimate the tastebud pleasing power of the home made crouton! Once the potatoes are ready to go, throw everything onto a big plate. This is a dinner entree, so don’t be shy, pile it on! The non-vegetarian version looks like pretty good too! Just add some steak and drizzle on some of the dressing. Now you get to eat!! 1. Toss all ingredients together, drizzle with Spicy Caesar Salad Dressing and serve! Add the minced garlic to a bowl. Throw in the Dijon, add the egg yolks and whisk to combine. Squeeze in the lemon juice, and add the Worcestershire sauce. Mince up the chipotle peppers and add them to the dressing. Whisk it all together, then begin drizzling in the olive oil in a thin stream, whisking constantly to thicken. Slowly but surely, it will turn into a nice thick dressing. Add salt and pepper to taste. To Italians, this constitutes a salad….lololol! Just replace the lettuce or anything green with a baguette, and voila! A Salad in Italy! I’m not making fun either, this is truly my idea of a salad. A variety of great, rich flavours mixed with buttery carbs; you really can’t go wrong. Only one question remains….Why don’t I live in Italy? Add a generous heap of fresh Parmesan to the baguette cubes. Mix in the dressing and stir until evenly combined. Bake @ 350 until golden and crusty. Mix the veggies, cheese and croutons together in a bowl, and then whip up the salad dressing. Add the dressing right before serving to make sure the croutons don’t get soggy. The only thing missing from this “salad” that I would add next time would be artichokes. 1. Combine the prepared vegetables together (peppers, tomatoes, onions, basil and artichokes) in a large mixing bowl. 2. Combine the oil, vinegar, sugar, salt and pepper and lemon zest. Whisk to thoroughly combine all ingredients. 3. Place croutons (still warm if possible!) in the bowl with the vegetables and cheese, and lightly toss with dressing. Check the seasoning and adjust if necessary. 2. Cut the baguette into large cubes and toss with salt and pepper, crushed whole garlic cloves, picked thyme/rosemary, butter and olive oil. 3. Place the croutons in oven until they become golden but are still soft in the middle. I hesitate to use the word “asian” to describe a recipe like this coleslaw, because it sounds a bit too generic and simplified, or “Kelsey-fied”, if you will. (Apologies to any Kelsey’s fans out there). I’m fully aware of (and enjoy!) all the subtelties of cusine that comes out of asia, but what if I say it’s asian inspired….does that still make me sound ignorant? ANYWAYS, this recipe uses lots of ingredients typically found in asian cooking, like ginger, peanuts and bean sprouts, so for the sake of being somewhat descriptive, I’ll refer to this coleslaw as a “vaguely asian inspired crunchy coleslaw”. I wonder if anyone has ever put this much thought into coleslaw before? My guess is probably not. So this coleslaw has an oil and vinegar base, meaning it isn’t as heavy as coleslaw can sometimes be, and is great as a side dish for something like Sweet and Spicy Glazed Drumsticks, or even a healthy lunch. I pulsed the cabbage in the food processor a few times to get it small enough to eat so it wasn’t awkward, and sliced the other veggies thinly by hand. Throw on a light, zesty dressing and you’ll have a flavour-packed dish that’s ready in no time. The longer it sits in the fridge, the more the flavours will intensify so don’t be afraid to serve it again a few days later. The raw veggies make sure the whole thing stays crunchy, too. This is a perfect summer salad. It’s a great side dish for something BBQ’d, or just a light and healthy lunch. The strawberries, feta and toasted almonds are a surprising combination, but the flavours are great together. And a sweet mapley dressing ties everything together flawlessly. 1. Mix the honey, mustard, vinegars, brown sugar and oil. 2. 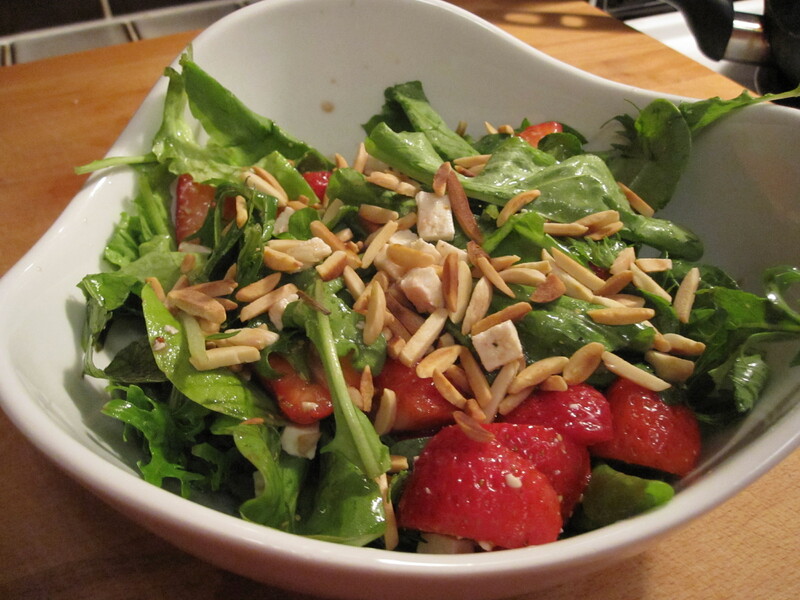 Toss the lettuce, almonds, strawberries and feta with the dressing to coat.